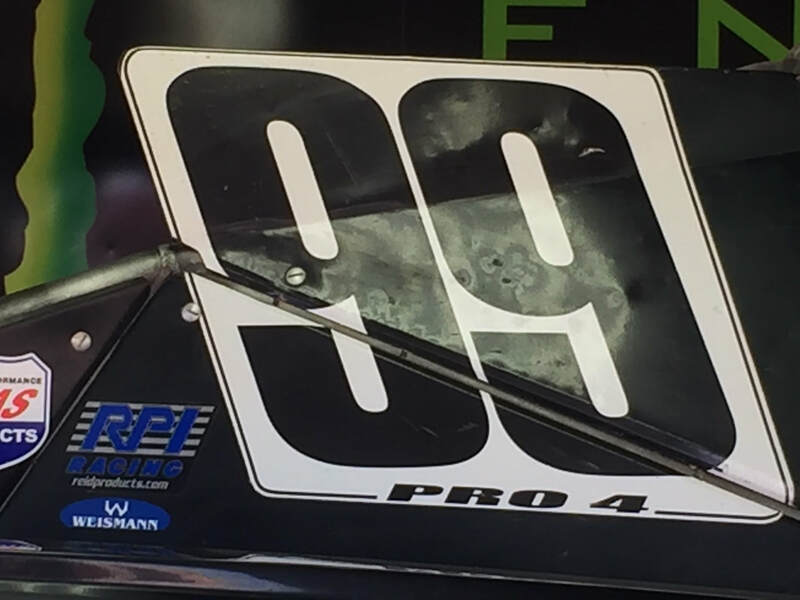 Reigning Pro 4 Champion Kyle LeDuc drove a masterful race from last place without getting a scratch on his truck to secure his 5th Pro 4 Crown in 6 years and his 4th in a row with our awesome Weismann UnLocker! 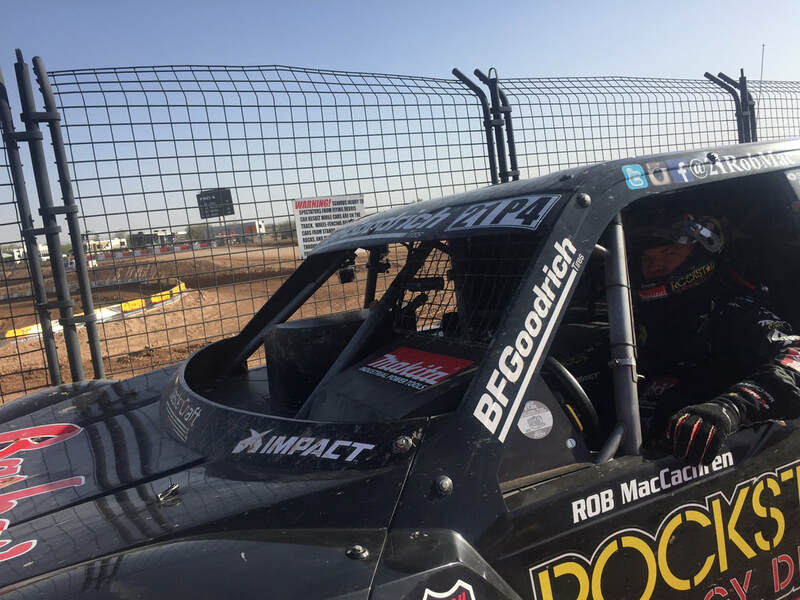 At a 5 turn, high-banked race track at the Wild Horse Pass Motorsports Park, the final race of the 2017 Pro 4 Championship season took place between Offroad Champions Kyle LeDuc and Rob MacCachren. It was Weismann ULR UnLocker against Weismann SWR UnLocker. Kyle LeDuc was on pole for the start, but during the formation lap he dropped off the lead spot and fell to last position. It appeared to the announcers and almost everyone else that he had a mechanical issue. So as the green flag dropped, Eric Barron led with Carl Renezeder, RJ Anderson, Rob MacCachren, and Greg Adler following close behind. Lap two saw Renezeder run out of talent in turn three and spin on his own. He then stayed put and forced the yellow to come out, then miraculously, he took off and joined the back of the field. During the yellow, the crafty LeDuc let Renezeder by as he knew Carl was trying to win his last race and didn't want to be run into! The race restarted and Barron again led the way, setting fastest lap of the race with our ULR Unlocker until on lap seven he just drove into the pits with an engine problem. The announcers didn't even notice as they were still taking about Kyle and his mechanical issues at the back of the pack. Out front Anderson, also racing with our ULR Unlocker, over-rotated in rutted turn three and MacCachren slipped by and up to first with our SideWinder. MacCachren was where he needed to be to have a shot at winning the championship, especially to the announcers since they were sure that Kyle, who was lumbering around in last place, was out of it. On the restart, Anderson, Adler, and Mittag all came together at the exit of turn one and lucky Renezeder squeaked past and up into second, Bradley Morris followed into 3rd, Mittag came out in 4th, and out of nowhere, LeDuc was up into 5th. 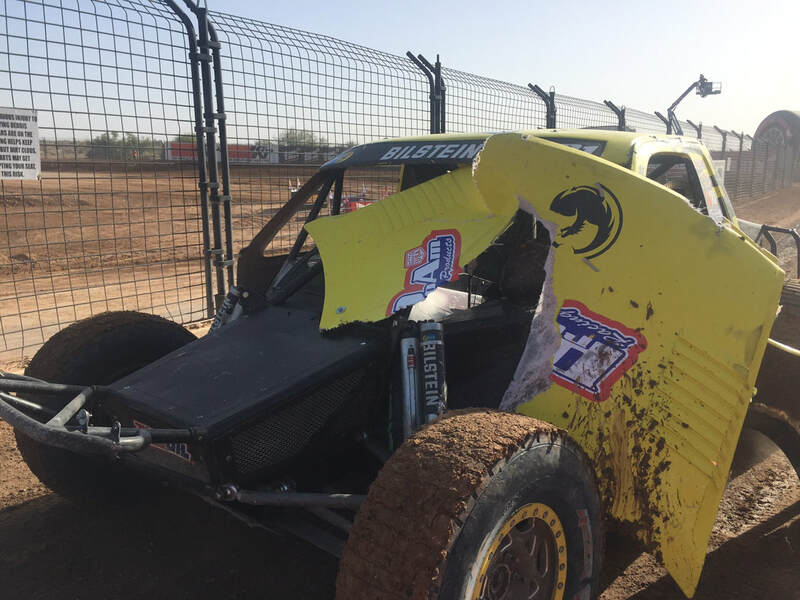 Rob MacCachren, leading with our SWR Sidewinder, had the race win in hand and potentially the Pro 4 Championship, but a rare mistake cost him dearly as he tried to defend his position against Carl Renezeder, who was desperate to win his last race. The pair got their bumpers tangled up in turn three, and Kyle sailed around the outside of them. Out came the full course yellow and the tow trucks to separate them. 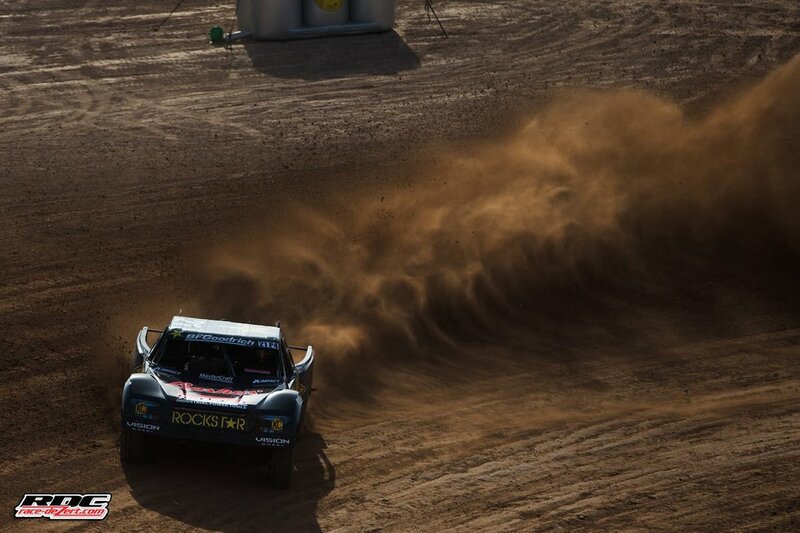 Morris now had the lead, LeDuc was now sitting pretty in 2nd, and the veteran Greg Adler was up to 3rd. Adrian Cenni, keeping out of trouble up until this point, was up into 5th. 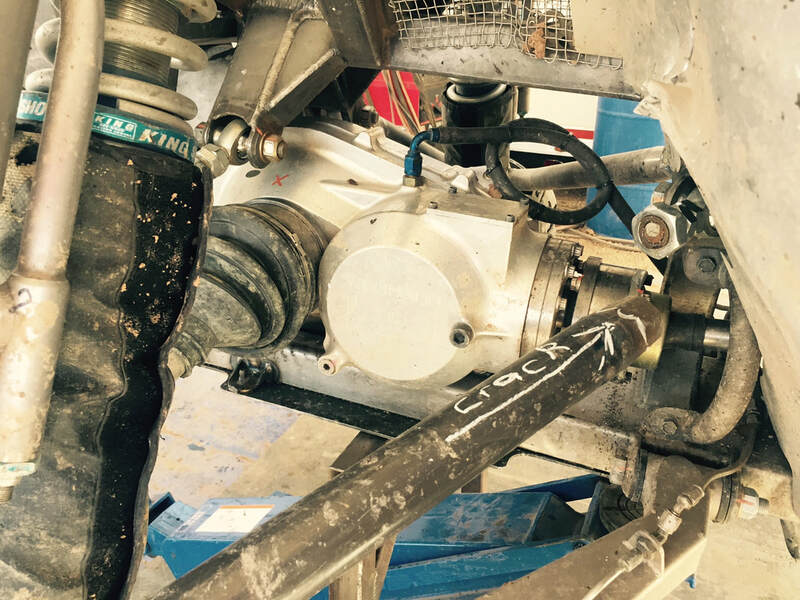 Lap 14 and the restart and Doug Fortin pulled off the track with, yet again, another drivetrain failure. Another full course yellow for debris on the track, and then another restart. Hard charging, Renezeder slipped by Cenni for 4th into turn two, setting up Mittag then passing Cenni at turn three. Lap 16, LeDuc, to the utter amazement of the announcers, rocketed past Morris on the uphill run to turn two and into the lead! Kyle said after the race that he knew Morris, trying to protect his lead, was going to slam into the big rut down on the inside of turn one. So Kyle moved outside and sure enough, the young Morris, exploded his rear tire in the rut. Adler, Renezeder, Mittag, and MacCachren all got by the unfortunate Morris. And then, as fate would have it, the over-zealous Renezeder got up in two wheels going up the bank into turn two and barrel rolled it! Yellow-flag-happy-throwing officials were quick with the yellow flag, even before he finished rolling back onto all 4 wheels! Among cheers and jeers, Carl kept it lit and continued. Another restart and Mittag got Adler for 2nd. White flag and the talented Morris was back in the race with a fresh rear tire and running 5th when he had another devastating driveline failure and dropped out. Up front Kyle was leading, Mittag, with his fender and hood in his face was second. MacCachren, in 4th, got through the narrowest of openings on the inside of Adler into turn four, and was now side by side with the battling Adler through the bank and into the final turn and jump! 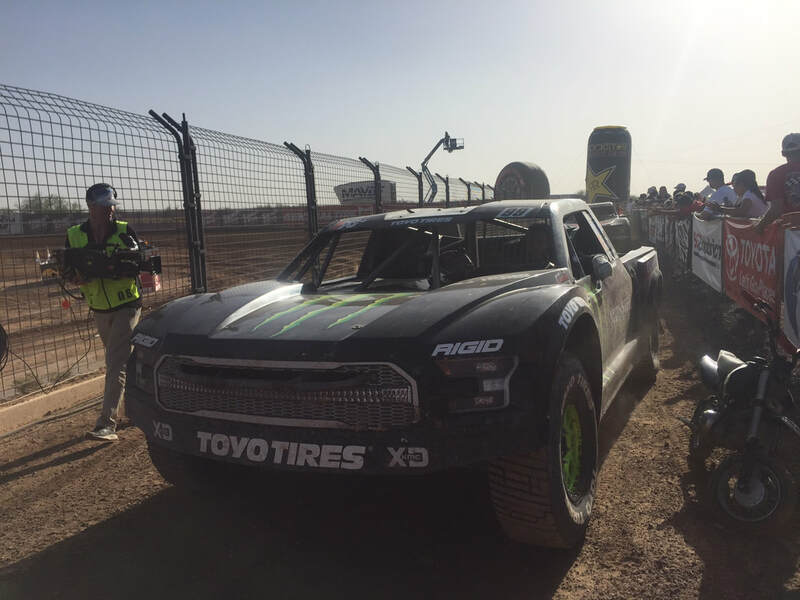 Kyle was ripping across the finish line as MacCachren then launched his truck over the final jump, through the dusty air, and past the hapless Mittag at the flag for an amazing second place! Kyle LeDuc got the win and the crown! Second was Rob MacCachren, third was Doug Mittag, fourth was Greg Adler, and fifth was Adrian "The Wildman" Cenni. The top 5 were all racing with Weismann UnLockers! ULR, SWR, ULR, SWR, SWR! Post race inspection of our SWR and to see why Cenni was off the pace. There might be a CRACR right where the arrow was showing, but you can see that the rod end was cracked even before he started the race. It's all rusty where the crack was. 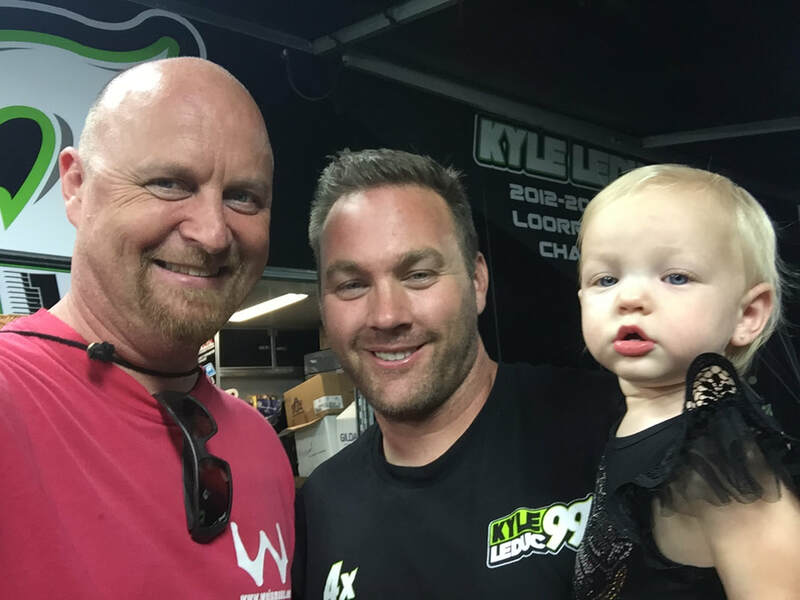 Celebrating with 5x Champ Kyle LeDuc and the latest racer in the LeDuc family, Lady Addie! Kyle LeDuc and Chris Weismann posing with the championship winning truck. New comer to the sport, Randy Minnier, has decided to enter the sport in style and he has bought the whole winning package. Welcome Randy and Pete!